Oh wait, but I am, and it's quite appropriate too. Harry was not a hero by himself; Harry was inevitable, he existed because of evil. Furthermore, Harry did not solve evil by himself. He needed Hermione (the scholars), he needed Ron (umm....), he needed Marcel (ummm....). Likewise, evil has Voldemort (the impact factors), deatheathers (ummm....)... Okay, okay, let stop pushing the parallel before it gets embarrassing. Point is, Harry was insensitive, clumsy, in many ways naive. And so is Plan S. Harry did not want to have to fight Voldemort. But evil demanded Plan S, ummm, Harry to exist. So, with the big Plan S event tomorrow in The Netherlands I am trying to organize my thoughts. We've seen wonderful discussions over the past month, which have highlighted the full setting in a lot of detail. Just this week, a nice overview of how learned societies do not make profit by making profit but spending that on important thing (doi:10.1073/pnas.1900359116 and draft blog analysis). Neither provide all the details, partly because this publishing world is not fully transparent. Another wonderful aspect of the effect of Plan S is that people seriously talk about Open Science. Many against the current Plan S still find Open Science important, and the details of the arguments are exciting and complex. I understand most of the concerns, tho I do not believe all are realistic. For example, I honestly do not believe that researchers would turn their (financial) back at their learned societies if they moved to a full OA model (an actual argument I have heard). But then again, I'm naive myself. Now, last week Plan U suggests that preprint servers provide a better solution. I disagree. The current Plan U is too risky. I tweeted some considerations yesterday, which I'll put below. Let me put up front, I like preprint servers, see the 21st tweet. a preprint without a proper license is not #openscience and does not optimally help raise the level of science. 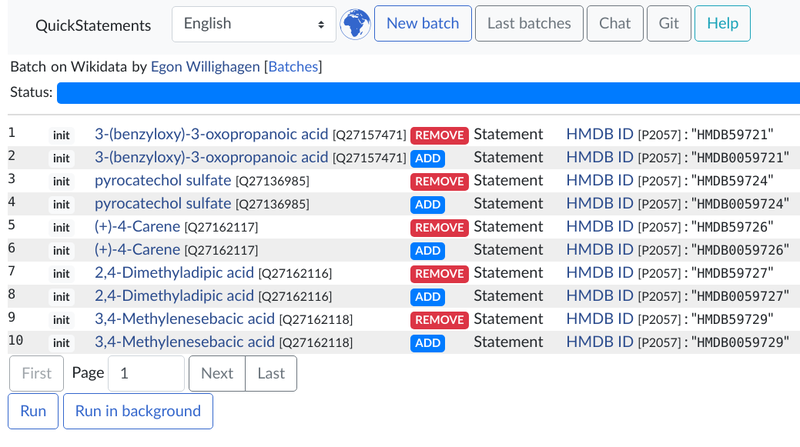 HMDB identifiers for 5 Wikidata compounds. 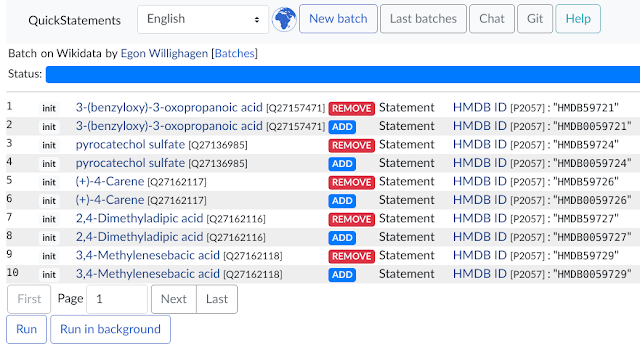 I ran the statements in batches, allowing me to keep track of the progress. Some reflection: there was quite a bit of references on the statements that got lost. The previous HMDB identifiers were often sourced from ChEBI. But the new identifiers do not come from there, they're sourced from Wikidata and adding "stated in" "Wikidata" did not make sense to me. Another thought is that it would have been nice to combine the removal and addition in one edit, but since they are executed right after each other, the version control will keep them together anyway. The Bioclipse script can be found here. Plan S (Wikipedia, Scholia) is here to stay. The pros and cons are still being explored, but with the list of participants and endorsements still growing (the latest endorsement comes from the African Academy of Sciences), it seems unlikely the ten principles will be disregarded. The implementation, however, may still change. I'm still looking forward to hearing more about the alleged improper lobbying and CoI of Frontiers. I have some thoughts and observations about Frontiers myself. Meanwhile, one aspect Plan S highlights are the huge differences in politics between European countries. An ongoing debate in Germany about whether scholars have a legal unlimited freedom to publish where they want (ethical or not) is yet unsettled, I think. And Norway did not seem to have discussed Open Access publishing much yet, and it has been suggested that the sudden introduction of Plan S may be unlawful. The situation in The Netherlands regarding the latter is different, in that Plan S here naturally follows from a direction chosen by the Dutch government some years ago. This resulted in a formal advice of the Dutch Presidency, the Amsterdam Call for Action on Open Science (2016) and governmental policies based on that. During the Presidency a formal meeting was organized in, no surprise, Amsterdam, where a draft was presented and formally discussed with stakeholders. Individual researchers had been invited, and with some luck my reply to the invitation was accepted and I joined the meeting. My main comment on the draft Call. I cannot say the meeting left a lot of room for improvement, and the draft was shared with participants only very shortly before the meeting. 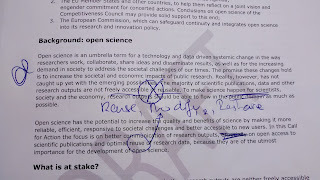 I stressed the importance of three core (user) rights of Open Science: reuse, modify, redistribute, but while some other points were picked up (I don't think the organizers had a lot of room, as it would be signed on the spot and presented to the European Union), this point did not get picked up. Now, Plan S also fails to mention these rights, which I consider a serious flaw. Instead, they choose to focus on a specific implementation of those three rights. This is counter normal procedures in European politics or at least Dutch European politics, where things are generally kept vague to be refined later. Of course, the discussions on Open Science did not start early 2016. Dutch politics is not that fast. One aspect of the Dutch discussion has been that the focus has been too much on the cost of open access publishing, and this leaks into Plan S, is my impression. But Dutch research institutes (particularly via their libraries) have brought up the unsustainable situation of journal subscriptions for quite a bit longer. I seem to remember the discussion of big package deals when I was a student in the nineties, a time where individual researchers and researchers still have "personal" subscriptions. I used to read JCIM (JCICS at the time) at the CAOS/CAMM (see doi:10.1007/978-3-642-74373-3_51). Yes, the need for this reform has been discussed for at least 20 years in The Netherlands. For me, as a Dutch researcher, Plan S is not radical nor a surprise (*): it is a natural consequence of publishers resisting the needed reforms that have been started years ago, and upon which subscription deals between the Dutch universities and publishers have been based. With less than two years to go, the ambition set out by the Dutch government to be 100% Open Access by 2020 was and is far away (unless there is some radical change to an exponential increase in these last months). So, if the Dutch government wants to keep its political promise, a radical change was needed. The only surprise (hence the *) is, perhaps, that they wanted to keep their promise. Since the Amsterdam Call, the Dutch government further involved Dutch researchers, via the National Platform Open Science (NPOS), where various researcher organizations are actively involved (postdoc network, VSNU, etc, etc). NPOS has been underfunded and the involvement of researchers could have been a lot better. It must also be mentioned that Plan S, as far as I know, has not been discussed at this level of NPOS. I expect it did get discussed by the participating NPOS partners (which included NWO). This is not surprising to me either, though I would very much appreciate a weaker hierarchy. But that hierarchy is very Dutch, and even researchers indicate to not have time for all those discussion, so things are self-organized in representing organizations: it seems the general Dutch consensus was (mind you, I'm an ECR, I did not design this, and this approach is not uncontroversial, as #WOinActie makes clear) that representation is the best way forward. And as far as I can see, this is how Plan S came about. But the discussions around Plan S make clear that a lot of researchers feel left out. Understandably, but that is the Dutch academic culture to blame, not the Dutch funders: individual researchers rarely get asked for feedback on national guidance/policy documents. At the same time, that does not invalidate their concerns either, of course. So, while the above may not have said it, I like what cOAlition is attempting to do: the publishing system is breaking down and must be fixed and only few publishers are making a serious effort (at a time where some publishers make huge profits). The discussion has been nasty on both sides. Insinuations that gold Open Access journals are not interested in quality are hurtful (remember, I'm editor-in-chief of such a journal, and I work overtime to ensure the highest standards for our articles, but know the limitations of publication platforms (see this post) and peer review, despite the journal having access to very qualified researcher pool). Being an academic, you need holiday to sit down and do something you care about but that is not paid for. For me, commenting on Plan S, or contributing as critical observer to the NPOS, is one of that. Even finding time for that interview about Plan S in ScienceGuide has been hard. There is plenty more to annotate, including the letter of support of the principles (see doi:10.1038/d41586-018-07632-2). I signed this letter: while I do not agree with the wording of all principles, putting it into context of the Dutch situation, their intentions make a lot of sense. But I have to say, I may have been rushed into signing it, with the Too Risky? using various fallacies and suggesting it represents researchers in general (the letter does not say that literally, neither do they make it clear to just speak on behalf of the signers, causing a lot of press media to misrepresent the letter). The letter sketches a doom scenario and is worded what the open source community would refer to as FUD: fear, uncertainty, and doubt. Effectively what happened is that this Too Risky? letter has caused (for me), is how hard some serious effort is needed to make the required changes. Every change has consequences. One team focuses on the positive consequences, another team focuses on the negative consequences. I do not know what Plan S will bring us. My name is not Nostradamus (or this Dutch reference). I do know the risks of the current system. Those are easily named and have been apparent for at least two decades. Too Risky? The current system has already done a lot of harm and is proven risky. I am happy that Dutch funders dare to invest in the future. 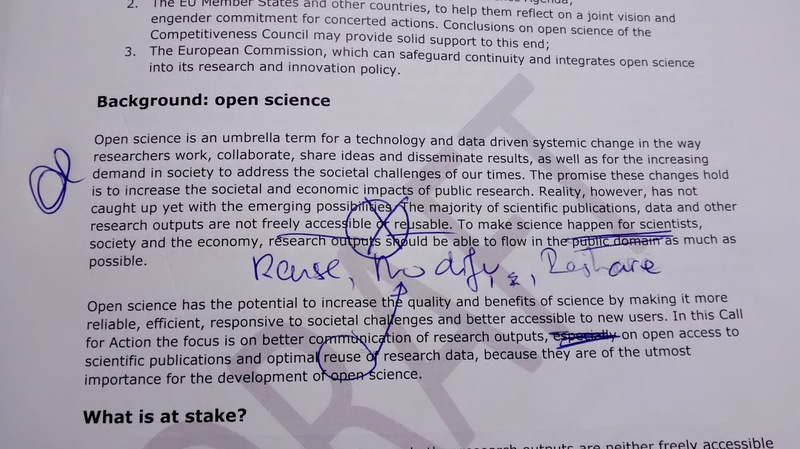 Plan S may not be the right option, and I am looking forward to alternative solutions that ensure the three rights of Open Science (reuse, modify, redistribute). People have freedom to choice if they want to practice Open Science or not. That freedom is, in The Netherlands in recent times, limited by several things, but the limitation that the Dutch national funders wants research to benefit Dutch society is in line with Dutch political climate of the past decade (think Nationale Wetenschapsagenda).